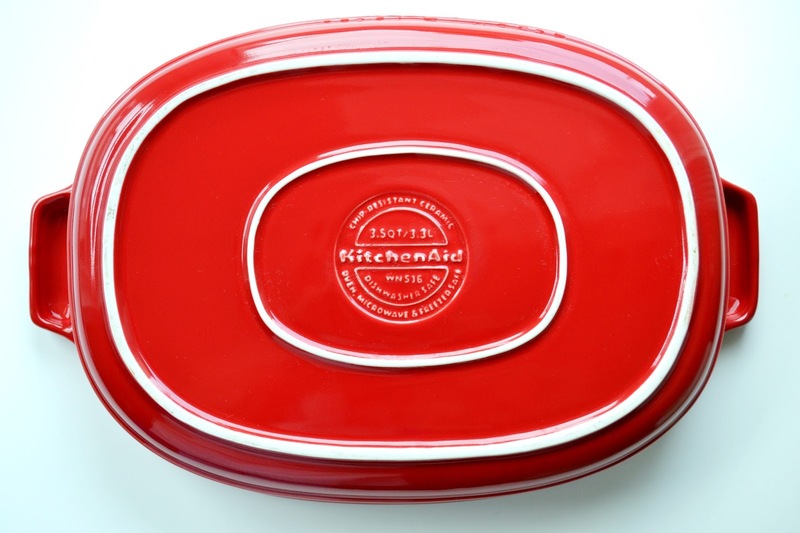 Disclosure: I was provided with a set of ceramic bakeware from KitchenAid Canada for my own kitchen at no cost to myself, plus another set to give away here on the blog. I know so many of you are hoping to get this awesome prize into your own kitchens in time for our return to fall comfort foods and holiday cooking. Thanksgiving sneaks up on me every year (it's only 3 weeks away, Canada! ), but this year I'm ready with this gorgeous 6-piece set of ceramic bakeware from KitchenAid Canada that goes from freezer to oven to table with ease and serving style. 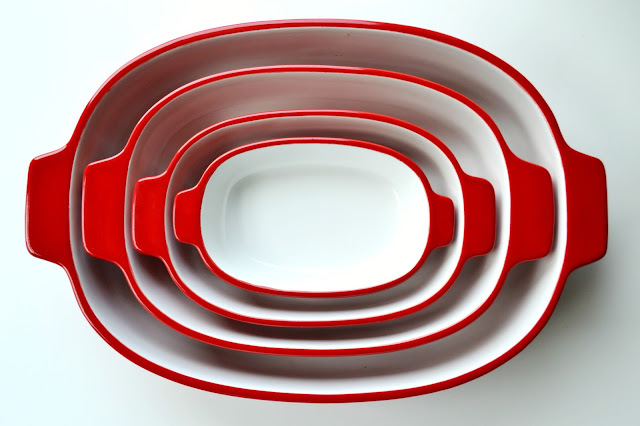 I love great bakeware, especially when it's sturdy and great-looking. These new casseroles from KitchenAid fit the bill, and they are already in regular use in my kitchen. The latest dinner I made in these was in the large square casserole - baked chicken thighs with creamy leek and mushroom rice. 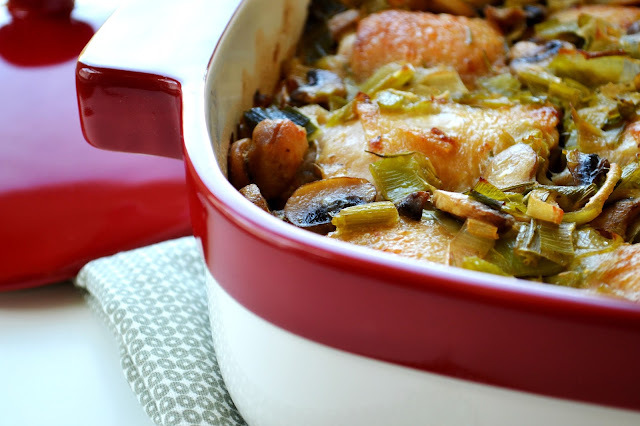 So delish, and with the size of this casserole there was plenty for leftover lunches. I'm enjoying these beauties and I know you would too. So, let's get right to it. Made of non-porous vitrified porcelain so it won't absorb oils, odors or sauces. It also resists staining, chipping and cracking. Comes with matching ceramic lid in Empire Red. Strong enough to handle the extreme temperatures of the freezer, oven and microwave, yet beautiful enough to go straight to the table as a serving dish. 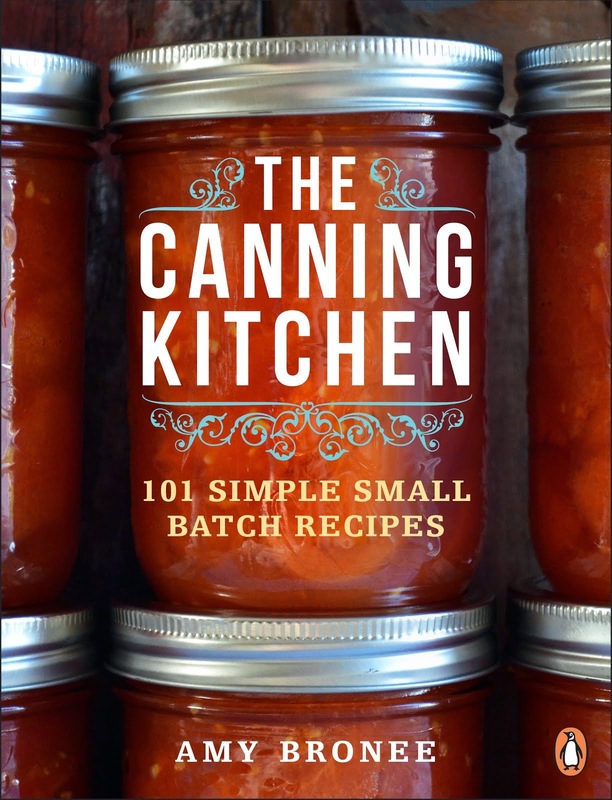 Includes casseroles in four quart sizes, 0.3, 0.7, 1.5, and 3.5 that nest for easy storage. Attractive contemporary-styled casseroles that retain heat longer than standard bakeware and are ideal for lasagna, noodle casseroles, shepherd's pie, scalloped potatoes and more. Made of non-porous vitrified porcelain so they won't absorb oils, odors or sauces. They also resist staining, chipping and cracking. To enter, leave a comment on this blog post (please include your email address so I can contact you if you win) sharing what you look forward to making this fall in ceramic bakeware. 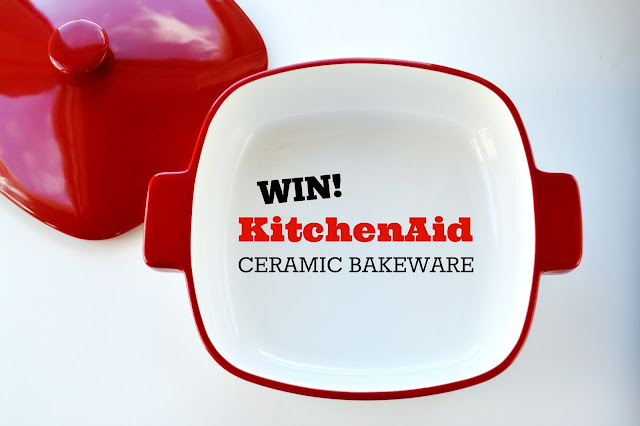 For one extra entry, you can Tweet the following: "I entered to win ceramic bakeware from @KitchenAid_CA on @FamilyFeedbag and you can too http://bit.ly/1KWqMn2." Contest closes Saturday, September 26, 2015 at 9 p.m. Eastern/6 p.m. Pacific. Open to Canadian residents only. One entry per person, per day. 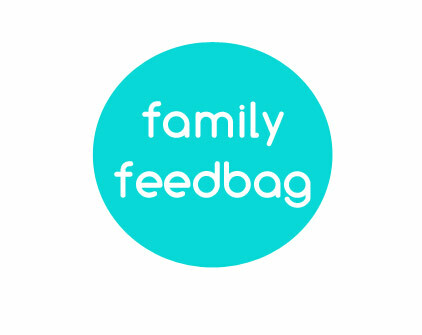 Winner will be selected randomly and announced on FamilyFeedbag.com and associated social media channels. I would love to make No Knead Bread in the Ceramic Casserole dish! I usually make my stuffing in a dish because I have to make so much of it. my fav part of Thanksgiving turkey, the stuffing. I would make a Great Thanksgiving meal this year with these! They are gorgeous! I would cook my grandma's recipe for baked spaghetti. Oh yum! It would be wonderful to cozy up on crisp fall day with this in these beautiful ceramic bakeware! I look forward to making an apple crisp in this bakeware! I would make a roast with carrots and scalloped potatoes. I look for to making apple rhubarb crisp. 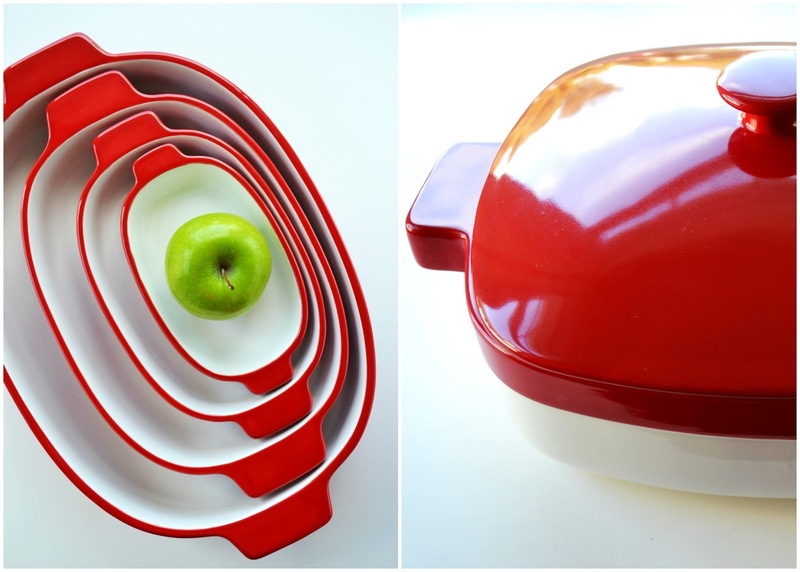 I am so sad :( I've been waiting for you to post this giveaway since you first posted a picture of these beautiful kitchenaid nesting casserole dishwear. But, I live in the USA. With the cooler weather there are so many wonderful dishes one could make. I would start with Chicken Mushroom Hotdish, roasted cauliflower, and a big apple crisp for dessert. mamahenof5@gmsil.com Good luck to all you Canadians! What a beautiful cookware set! I think I'd be making my dad's baked beans (secret family recipe), scalloped potatoes, ham and a big ol' batch of homemade apple crisp! That's my kind of Fall comfort food! My email is: thebakingbookworm@gmail.com. These are such great quality. I'd first make a baked penne dish. My twitter name is @melita_snow Thanks for the chance! I would make lasagna yum! I would like to make some apple crisps, some veggie lentil rice dishes, roast chicken , some baked squash... Lots of things! Thanks for offering such a great giveaway! I would make baked mac and cheese. I love braised dishes, but in a two-person household, I don't usually need to make a massive amount. That casserole would be perfect! Amy, you have such a great eye and such interesting, creative photo ideas. I'd use this cookware to tote deliciousness in its many forms to a friend's house for Saturday night dinners with his kids. So count on gypsy soup and lasagne, rhubarb crisp and the best fall food of all, homemade mac 'n cheese. Happy travels, and lady, you cook!!! This would be amazing for me as I just moved into a new apartment and have virtually no bakeware and I have many thanksgiving dinners to plan and cook for. I would definitely make my delicious truffle mac&cheese, honey glazed ham, or my mom's cinnamon apple crisp. My email address is thefancynancypr@gmail.com and my website www.thefancynancy19.com. I'm a sucker for fall foods, especially casseroles. However, I have a lovely pork chop bake I'd love to try in one of these beautiful pieces! I would make a pot of steaming bread pudding packed with lots of spices and fruits to welcome autumn. I love, love fall and one of my favourite parts is all of the comforting foods. I can't wait to make a lasagna in these gorgeous casserole dishes. I am also growing turnips for the first time and saw a yummy-looking gratin that I would love to make in one of the smaller dishes. My email is pickytoplenty@gmail.com and my blog can be found at www.pickytoplenty.com. Well being a mom and gramma....the list is endless. If I had it RIGHT NOW I would be making my daughter's favourite mac and cheese casserole for her birthday tomorrow!! I look forward to making cabbage rolls this fall. tweeted fossie at hotmail dot com. What wouldn't I make? Roasted chicken, casseroles... the possibility are endless! Very nice giveaway! I LOVE to bake with my kiddies!! I would make my Fav Moussaka recipe! Thank you for the opportunity. They look great.I love the colour! Perfect for serving straight from oven to table. I would love to make my Peach and Blueberry Baked Oatmeal in the large nesting casserole and the lidded casserole would be perfect for making barbecue baked beans which need to be slow cooked for hours. Just in case I win (I doubt it as I never win anything but you never know!) my email is melmcdonald11@gmail.com. Thanks, its a great giveaway! they are beautiful dishes = wow!! I would make lots of apple crisp in those! Thanks for the chance! I can't wait to make cabbage rolls! Yum!! What a nice prize. The winner will be a very fortunate cook. Kjpenchuk@gmail.com would be great to teach my dayhome kids to cook straight from the garden. Two things come to mind to make! Off the top of my head my famous lasagna or with Thanksgiving around the corner, I would make my sweet potato souffle! lasagna! MMM... or macaroni, hamburger and tomatoes baked with cheese. Dishes for Thanksgiving, stuffing, yam potatoes. Me me me! Turkey dinner! The whole shebang! Will host my uncles and folks and this set would look fab with my vintage milk glass serving bowls. I would love to make an apple crisp! How yummy! 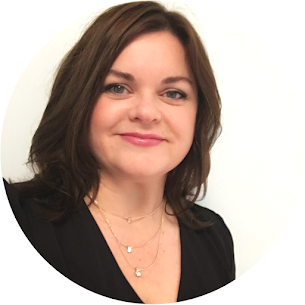 I would use one of the smaller dishes to make a baked bean dish which my kids love - I use regular canned baked beans and throw them in the dish with some onion and garlic and cover it all with rashers of bacon and bake it! With all that bacon fat ...... omg, yummy! I would make scalloped potatoes. I would make lasagna & rice pudding. I can think of so many things I would love to make with this bakeware but if I had to just share one, I would probably make a big honey glazed ham for a fancy feast with my family! Apple crisp is on the menu these days, would love to make it in these. I would make apple crisp in this ! I'd love to make Mac & Cheese, Scalloped potatoes, & Chicken and broccoli bake, etc. I would try making hearth bread. You had me at nesting! I know my husband's favourite "Red Chicken" recipe would work so well in one of these dishes! I look forward to making lasagnas! I would love to make thanksgiving dishes and serve them in these beautiful dishes. Beans, bread pudding and mashed potatoes sound good. I would make a lovely roasted herb chicken with some side veggie dishes. So many ideas for these dishes! If I dont win them I will definitely be buying them! I am looking forward to making some fall crisps. With Thanksgiving on my mind I'd love to make a favourite side dish - Butternut Squash and Apple casserole - it is so good! I would love to make Apple Crisp with this. I would love to try some new pumpkin recipes.